Malta: the island the Romans called 'Melita' - meaning honey. 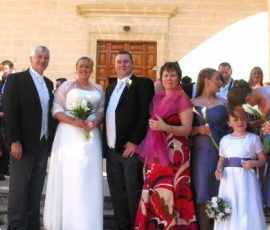 Mark was getting married and the nuptials were taking place in Malta. What a delicious combination: a foreign wedding and a week in Malta rolled into one! Time to enjoy with family and friends and an opportunity to see another little bit of the world. Of course I was going . Was there ever any doubt? On arrival at Malta International Airport, and on the short journey to the Alexandra Hotel in St. Julians, I was thinking what a lot must have changed since Roman times. Malta didn’t strike me as a land of honey at all – it looked barren, dried up and completely devoid of colour. There was nothing lavish or lush to be seen anywhere – no green, no lovely colours, all the buildings looked the same, and all were the same colour – an insipid beige! Thankfully, as I was to find out later, first impressions are not always right and it would be totally wrong to judge Malta by St. Julians. At our hotel we immediately noticed the warmth, friendliness and willingness to please of the Maltese. They are an efficient, helpful race – a mix of many peoples and cultures – in fact, one native described his people to me as mongrels! Well, mongrels they may be, but they are extremely pleasant ones – and they have somehow managed to extract only the good traits from the eclectic blend that is their physique. 86 of us had travelled from Ireland for the wedding of Mark and Janet and we were treated to a splendid day of relaxed and stress free enjoyment – somewhat in contrast to the frenzy and hype that has become part and parcel of 'the wedding' in the land of the Celtic Tiger. All was calm and understated from the expeditious and non-ostentatious church ceremony, to the deliciously languorous repast to the dallied refrains from the four-piece band. Of course, the obligatory disco afterwards is the same the world over. The entire stress-free occasion, according to the bride, was due to the professionalism and attention to detail of the wonderfully charming and terribly sophisticated Wedding Planner – Marielle – who looked as though she had just stepped from a famous Parisian Fashion House in her cream lace feminine top and her sharp black pencil skirt and her comfortable but chic cream shoes with pretty little black bows. She was the essence of cool efficiency from beginning to end, and from head to toe. It was Marielle who arranged the old world Villa for the reception with its picturesque gardens, marble staircase and large entrance hall complete with grand piano where each guest was greeted with a local liquor and black caviar. The setting was exquisite, the food was rich, the drink was flowing, the entire day was perfect and the newly weds were ecstatic. After a slow start the following morning, and with the wedding revelries behind us, it was time to get down to some serious investigating of Malta. We began at the top with the capital – Valetta – an impressive city – one of its most spectacular features being the marvellous vista from the Barracca Gardens – particularly the wonderful views of the Grand Harbour. From these luscious gardens the entire island seems to stretch in front of you as far as the eye can see and you will be amazed at the number of churches that are dotted along the skyline. Malta has more churches per square mile than any where else in the world and I am talking churches to rival anything that you will find in Rome: huge, ornate structures that house paintings by some of the world's best known painters including Carravaggios greatest masterpiece The Beheading of St. John – the only work that bears his signature. If you do nothing else in Valetta but see the views from its ramparts, your visit has been worthwhile. After this we decided to take in a Malta Experience. This video experience was advertised all over Valetta and as a brief synopsis of the history of Malta and its peoples and in particular the Knights Templar it’s a good exercise. Valetta is a city of history and culture dotted with churches and palaces - but ladies, it is also a shopper's paradise and for shoes/bags and costume jewellery it is hard to beat for style and value. We found some great dresses/bags and shoes and made a mental note to come back on Sunday morning to visit the large market that takes place at the Main Gates to the city from early to lunchtime. 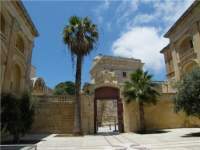 Valetta – called after a Grand Master of the Knights Templar - Jean Parisot de la Valette – was built as a walled fortress, much of which is intact today. The Grand Masters Palace and the Armoury are side by side – the Palace being quiet splendid and ornate and the Armoury containing over 5,000 items – as when a Knight died his armoury became the property of the Order. If you stop to eat outdoors anywhere in Malta, but particularly in Valetta, you cannot help but notice the pigeons – who come in swarms to the tables of the diners and are actually so tame that they will take food from your hand if you are patient enough! The bus journey from St. Julians to Valetta cost a paltry 50 cents per person but the ride can be quiet precarious and rather rocky due to the erratic and ill-mannered Maltese drivers, the road conditions and indeed the fact that the buses look like something used in Britain during the last war. A strange thing about the placid, friendly, helpful Maltese – put them behind the wheel of a car and they turn into raving lunatics loosing all sense of right and wrong and all respect for rules and other road users taking every chance that presents itself regardless of the consequences and, if you are not prepared to follow suit, you will be blown off the road amid vile gestures and mouthed obscenities. Quiet strange really! Oh! And I almost forgot to mention the Cats. The Maltese Cats seem to be everywhere you turn – unobtrusive and independent they appear to belong to no-one but seem to be looked after by all as though the Maltese exist simply to care for this large population of feline freewheelers. The following day we set out for Mdina – The Silent City – and if there had to be one thing that made my trip to Malta special – this was it. 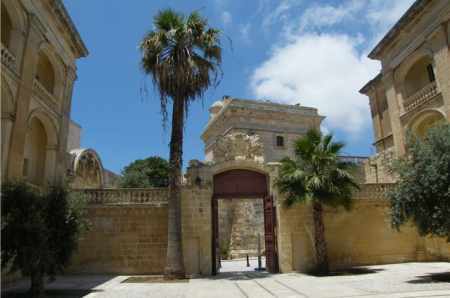 Mdina is more an experience than a place – once you enter its gates its as if you've gone through a time warp. The outside world ceases to exist as you roam this city from the past – in silence - lest you disturb its ghosts. Mdina ( pronounced 'Imdina') is one of those truly special places – an unspoilt treasure that has magically survived modernisation and progress. As you enter its narrow streets its like discovering an ancient site that has been buried for centuries and you are enveloped by the feeling that you are the first to discover it. Mdina is amazing and has to be experienced to be believed. 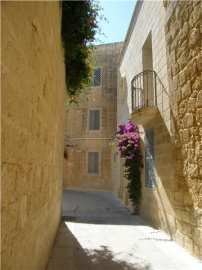 If you see nothing else in Malta – Mdina is a must. In my travels I am often overwhelmed by the sense that I am walking in the footsteps of those who have gone before, but in Mdina I got the feeling that those who had gone before were walking with me – I half expected to hear whispering and plotting around the next corner or at the end of its long narrow streets or catch a glimpse of the tail end of a cloak vanish through the next doorway – was it the quivering heat in St. Paul's Square or was that a Knight on bended knee praying to his God – who knows - one thing I do know is that I was never alone in this ancient city of Malta, full of mystery and wonder, mystic and intrigue – that belongs to its ghosts – I was a tolerated and very privileged guest. Mdina will beguile and fascinate you – and my guess is that you will never regret having seen it; it is one of those special places that continue to live in your memory long after you have left it. Almost directly across the road from Mdina is another city – Rabat – very pleasant in its own right but, after seeing Mdina, Rabat seems to be a most religious area and when we were there they seemed to be getting ready for some kind of religious festival or procession; the Square and streets were adorned with religious artefacts and bunting and a banner was draped across St. Paul's Church. This area is dedicated to St. Paul who is reputed to have brought Christianity to it when he was shipwrecked on his way to Rome and lived for 3 months in a cave outside the walls of the Roman city now called St. Paul's Grotto. The thing to visit in Rabat is the Catacombs of St. Paul and St. Agatha – where pagan, Jew and Christian are all united in death. I found the audio guided tour here excellent – it is given by a soft spoken early Christian called Valeria who tells you that her final resting place is here in the catacombs and consequently I found myself looking around everywhere for evidence of this haunting voice from the past and because of her what might otherwise have been an eerie experience touring the underground tombs of the dead - turned out to be a rather pleasant preamble with a lost friend – excellent sales pitch! Our trip to Gozo took the entire day – although the Ferry across only takes 25 minutes! It may be a small Island but, like its big sister Malta, there is just so much to see and so much beauty to admire that time just seemed to flutter by like the many multicoloured butterflies on this lovely oasis. Gozos charm is immediate – it is brighter, greener, prettier, friendlier, more lush, more relaxed, more charming, more remote, more rural and more unspoilt than Malta and indeed, even its resorts, like the lovely old fishing village of Xlendi, are less built up and less commercialised than their counterparts across the water. Gozo's capital, Victoria, is a charming old city criss-crossed by narrow twisting lanes and winding streets that all seem to lead upwards to the walled Citadel that dominates the landscape. From the ramparts one can view the entire island and once again, as in Malta, be impressed with the huge, ornate and elaborate Churches that rise majestically above all else on this diminutive Isle. As you leave the city and head towards the more rural parts of this island gem your senses will be assaulted by amazing panoramas of rugged, steep cliffs, wandering green valleys, beautiful azure inlets and mystic monuments – Gozo seems to have been as popular with early man as it is today and again you get a goose-pimply feeling of walking with ghosts as you view its many prehistoric temples. Mosta is another city worth a visit with yet another magnificient church that boasts one of the largest domes in the world and a bit of a story – The Rotunda of St. Marija Assunta has a truly spectacular dome as well as housing a replica of a bomb dropped here during the last war – the bomb dropped right into the middle of a 300 strong congregation who were just about to celebrated Mass: yet didn’t explode. The German Airman who dropped the bomb, and who also happened to be Catholic, wrestled with his conscience for years after the war - not knowing what death and destruction his action has caused until one day he heard the story on the radio and he was so relieved that he visited Malta and came to the Dome to view the wonderful structure and to give thanks to God that his mission had failed. Divine intervention at its best! The city of Mosta runs into another - Naxxar - the place where St. Paul is reputed to have dried his clothes after his ship floundered on the Maltese coast – and the name is suppose to mean 'to hang clothes to dry'. On our last day in Malta we decided to treat ourselves to lunch at La Palazzo Parisio – recommended to me by a friend - who knows me well. This is just my kinda place, and a nice treat before our departure from this lovely island holiday. La Palazzo Parisio is an Italian Villa situated on Victory Square in Naxxar and totally unimpressive from the outside. But trusting my friend’s judgement we decide to enter and walk off the ordinary footpath up the steps to the solid oak door and - Hey Presto! 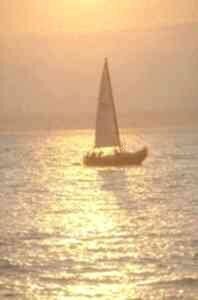 - straight into another world full of splendour and grandeur. The interior is rich and grandiose and exudes quality and class as befitted the home of one of the Grand Masters of the Knights of Malta. Today this lavish and ornate villa is owned and run by the Scicluna family – the Baroness and her daughter were both on the premises the day we visited – an added bonus. This ostentatious residence provides an exclusive venue for weddings and banquets, and houses an exquisite restaurant in its exotic gardens where we partook of the excellent food and wine presented by pleasant, efficient waiters classically attired in black and white. Ah sitting there in sultry sunshine, sipping crisp, clear Chardonnay, nibbling leafy greens, pine kernels and seared scallops, surrounded by infusing, intoxicating plants, enveloped in lively conversation among good friends – there was no better place to be and a truly appropriate conclusion to a wonderful holiday on this island paradise that is Malta. If you enjoyed reading the above article then you will probably also enjoy Valentia by Maria Nolan, and Munich, also in Europe, and our latest articles covering the Orinoco Delta, La Mata, Marbella and Beijing.